Sierra Nevada / Cigar City Beer Camp Yonder Bock - AoM: Beer et al. 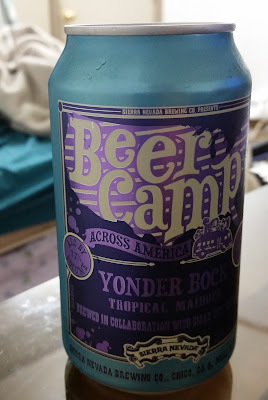 Unfortunately, I have a bunch of these old Beer Camp beers which are well beyond their intended drinking date and will taste vastly different. In any case, upon drinking this Yonder Bock, I was reminded of the taste of the sugars in the Dogfish Head 180 Minute IPA I had after it had aged. The one difference was that this aged beer didn't taste nearly as strong. In particular, the Yonder Bock was drinkable whereas the 180 Minute was barely sippable. Yonder Bock is a summery twist on the robust blonde bock. Its silky, semisweet malt body is bolstered by a blend of new and experimental hops that impart bright, fruity hop aromas of guava, mango and passion fruit.